Problems with technology continue to cause declines in owner satisfaction with long-term vehicle dependability, according to the J.D. Power 2016 U.S. Vehicle Dependability StudySM (VDS). The study shows that problems with vehicle audio, communication, entertainment, and navigation (ACEN) systems now account for 20% of all customer-reported problems. Furthermore, ACEN is now the most problematic area on most vehicles, and is the apparent cause of a 3% year-over-year decline in customer satisfaction with vehicle dependability. The problems most often reported by owners are related to Bluetooth pairing/connectivity and built-in voice-recognition systems misinterpreting commands. Difficulties with using the navigation system and inaccuracies in the navigation system are also among the 10 most frequently reported problems. Among the study’s key findings, perhaps most notable is that the overall industry average is 152 PP100 this year, compared with 147 PP100 in the 2015 study. Seven of the top 10 problems are design-related. Design-related problems account for 39% of problems reported in the 2016 study (60 PP100), an increase of 2 percentage points from 2015. In this year’s study, the number of engine/transmission problems decreases slightly, to 24 PP100 from 26 PP100 in 2015. Among owners who experienced a Bluetooth pairing or connectivity problem, 53% say the vehicle didn’t find or recognize their mobile device. Among owners who indicate having experienced a voice-recognition problem, 67% say the problem was related to the phone not recognizing, or misinterpreting, voice commands. “The decline in reliability coupled with a record number of vehicle recalls and safety-related complaints affect consumer confidence,” she concluded. Among owners who experienced no problems with their vehicle, 55% purchased the same brand again. Conversely, only 41% of owners who experienced three or more problems with their vehicle did likewise. Furthermore, only one-third of owners who had to replace a component outside of normal wear items say they “definitely will” repurchase or lease the same brand again. For a fifth consecutive year, Lexus ranks highest in vehicle dependability among all nameplates, with a score of 95 PP100. Porsche (97 PP100) follows Lexus in the rankings, moving up from fifth in 2015. Following Porsche in the rankings are Buick (106 PP100), Toyota (113 PP100), and GMC (120 PP100). General Motors (GM) is the automaker with the most segment awards at eight, while Toyota earns six. GM models receiving segment awards include the Buick Encore, Buick LaCrosse, Buick Verano, Chevrolet Camaro, Chevrolet Equinox, Chevrolet Malibu, Chevrolet Silverado HD, and GMC Yukon. Toyota models receiving segment awards include the Lexus ES, Lexus GS, Lexus GX, Toyota Prius V, Toyota Sienna, and Toyota Tundra. Others models to receive segment awards are the Fiat 500, Honda Fit, Mercedes-Benz GLK-Class, Mini Cooper, Mini Coupe/Roadster, and Nissan Murano. When researching your new vehicle, pay special attention to the different types of technologies that are available, noting any that other owners have found problematic. Compare various automakers’ technologies and read reports that might indicate which ones are superior or problematic. Before buying—perhaps during the test drive—ask your salesperson to demonstrate any vehicle technologies you are unfamiliar or uncomfortable with. The 2016 U.S. 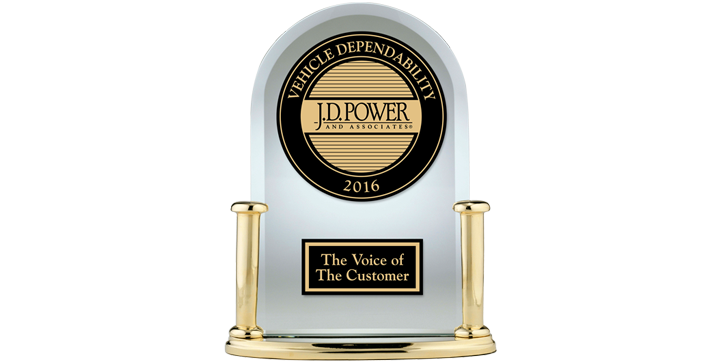 Vehicle Dependability Study is based on responses from 33,560 original owners of 2013 model-year vehicles after 3 years of ownership. The study was fielded from October through December 2015.